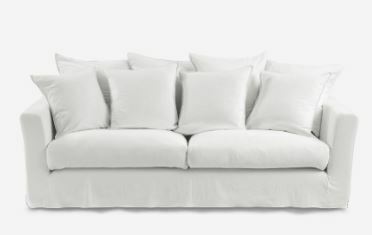 My name is Dee and I’m addicted to white, washed linen sofas’ is my confession. The epitome of French interior chic, I love how they effortlessly ooze the welcoming, lived in, ‘just left the room’ look that we all aspire to these days. They don’t even try to look good, they just do and are as comfortable and comforting as wearing your favourite jeans. They are the chic messy bun of interiors, the Levi’s cut offs of lounging and the Veja trainers of sofas - they go with anything and add effortless chic to any look. The crumpled nature of washed linen also adds texture to a room. White schemes can sometimes look sterile and unwelcoming but the addition of texture always reverses this. There is no colour in the picture below but the crumpled linen, the vintage books and the various woods are enough. Be still my beating heart …the perfect crumpled linen sofa. Image from Pinterest. White sofas have the benefit too of making any space look bigger. They appear to take up less room and if you get one on legs, it will make the room look airier still. Solid sofas with no legs can tend to look bulkier and monolithic, especially in darker colours. I have not, however, dared own a white linen sofa for the obvious reason that they will show up any and every mark and with three adolescents and a perpetually muddy dog in the house it’s an absolute recipe for disaster. Or is it? I did have a white cotton sofa in the front room for years and years until it wore out. The covers were removable and washable and, although we didn’t wash them enough (they were always covered in mud, orange juice, chocolate, red wine etc), when they WERE washed the sofa always looked like new. Even more importantly, if the stains didn’t come out then because the covers were white I was able to bleach them and you can’t do that with any other colour except for white obviously. I’d actually forgotten this important detail until recently and when I recalled it it was the light bulb moment to start the hunt for the perfect white crumpled linen sofa. Maison Du Monde always seem to come up with a chic, affordable version of anything. This 2 metre long sofa is only £949 and the covers are removable and washable. Everything Merci does makes me swoon. Merci Paris opened ten years ago and is always a must visit for me when I’m in Paris. Merci champions emerging designers and everything they do is of exceptional quality. This sofa is not cheap at £2720 but the quality will doubtless be excellent. The Truman sofa is one of the ultimate sofas I think - you buy it in sections so you can make it fit into any room size. It’s design and proportions are such that it will go with absolutely any look and it’s delivered in 3 to 5 days - a rarity in the sofa world where six weeks lead time is pretty standard. Att Pynta are a new interiors brand in Peckham and the shape of their Luca sofa is to die for. It costs from £2695 and the fabric in this case is dry clean only. This blog is about white linen sofas but Att Pynta also this sofa in velvet I’ve noticed and it’s totally swoonworthy - look! All the look of the relaxed crumpled linen sofa but in velvet! Anyway, I digress…. Maison Du Monde are the only brand I’ve found who are totally on it with washed linen sofas. They actually have seven styles of sofa on offer with washed linen covers, including this one called Francisco and Louvre mentioned above. Affordably priced at £973 the style and shape of this sofa make it look more expensive and the fact it’s on legs make it look more elegant and space saving, as discussed before. So, these are the top 5 white washed linen sofas that jumped out at me. In an ideal world of course I would rather not buy new and would love to take one of my existing sofas or a second hand sofa and get re-covered in crumpled white linen. This service, sadly, seems rare and the recovering services I did find did not offer white linen as an option. I plan to explore this subject soon for a whole blog post of it’s own and perhaps I should learn to sew my own! Note: Linen should be washed in lukewarm or cold water to avoid shrinkage.